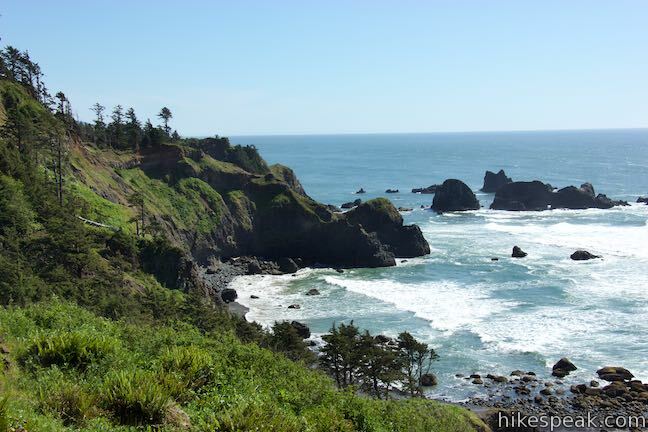 The Oregon coast is a rugged and wild with evergreen topped sea cliffs. 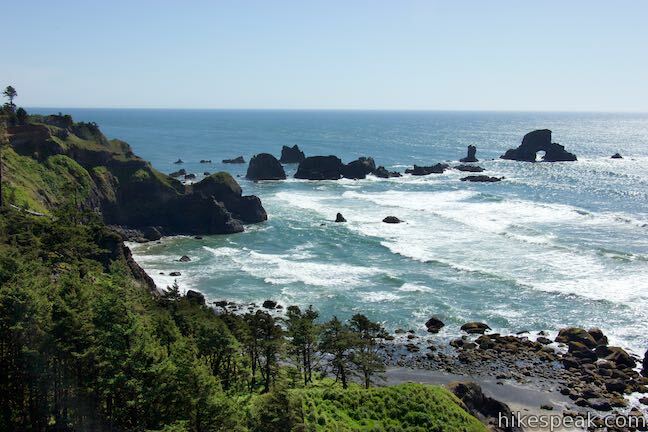 Jagged shorelines hide tucked away beaches and dramatic rocks islands. 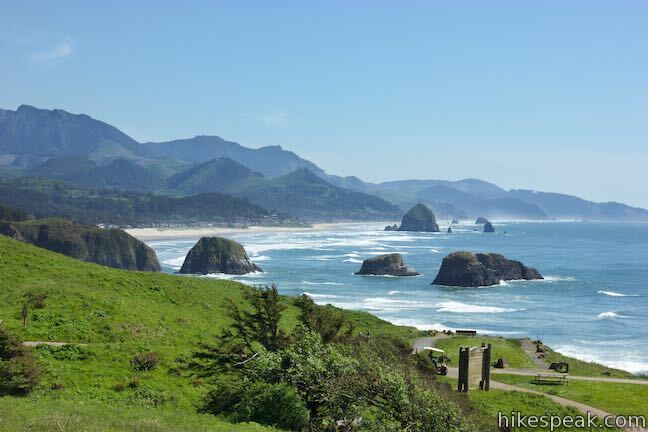 One great place to witness this beautiful scenery is Ecola State Park, preserving 1,024-acres on Tillamook Head, which is just north of Cannon Beach and about 80 miles northwest of Portland. 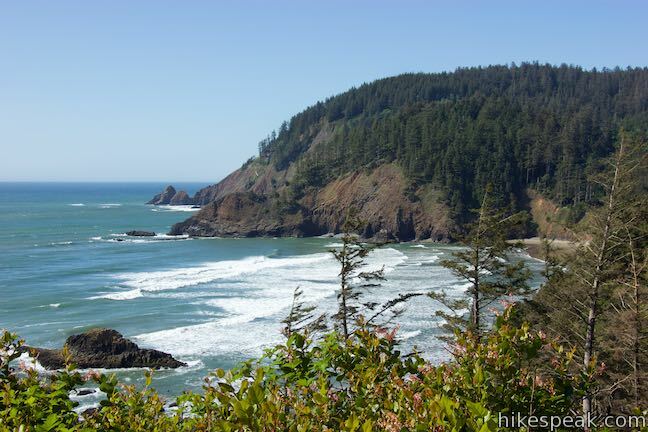 An 8-mile section of Oregon Coast Trail cuts through the park, including a 1 1/3-mile stretch connecting the park’s two main drive-up destinations, Ecola Point and Indian Beach. 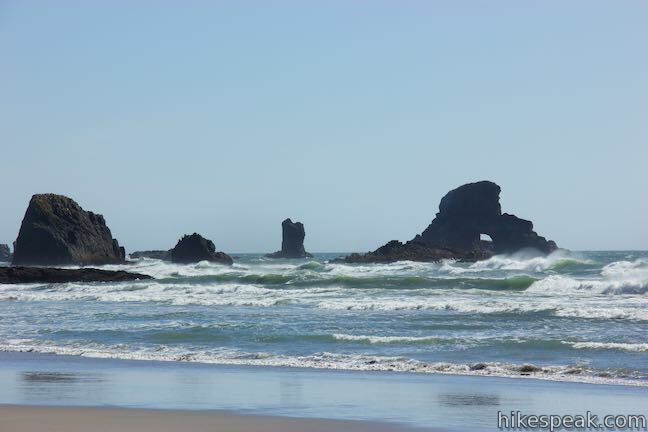 Ecola Point has the best views south down the coast over Cannon Beach and islands like Haystack Rocks. 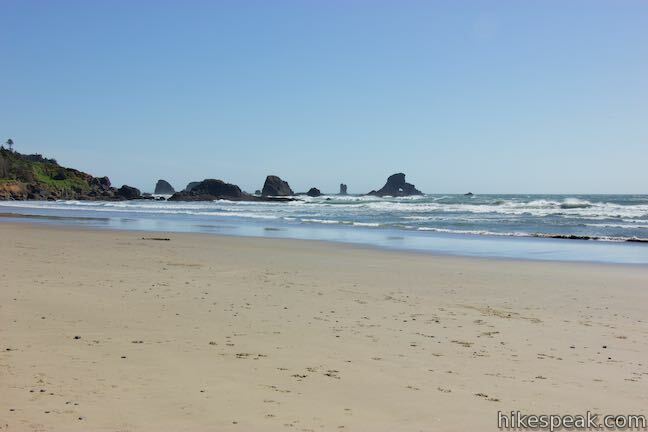 The sands of Indian Beach are broad and inviting, providing views of the lighthouse on Tillamook Rock. 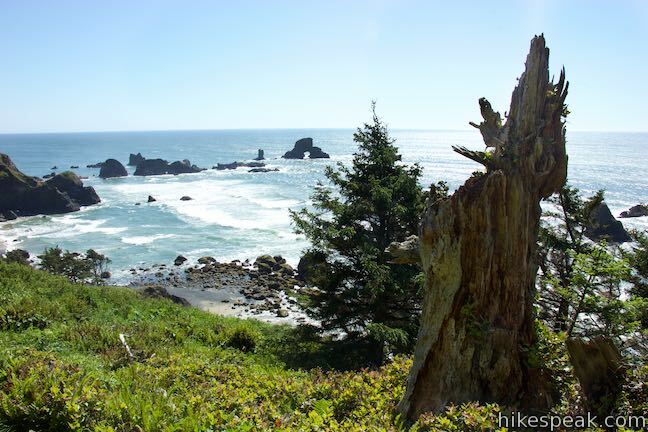 The hike between these two points crosses a forest by the sea, tackling undulating terrain as it passes unnamed viewpoints with spectacular ocean vistas! 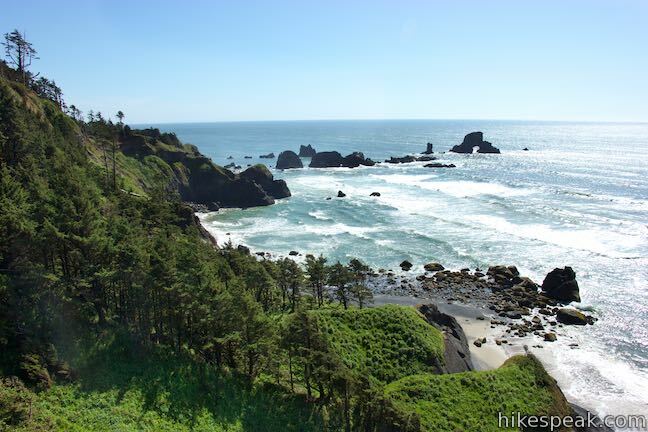 You can begin this hike from either Ecola Point or Indian Beach. 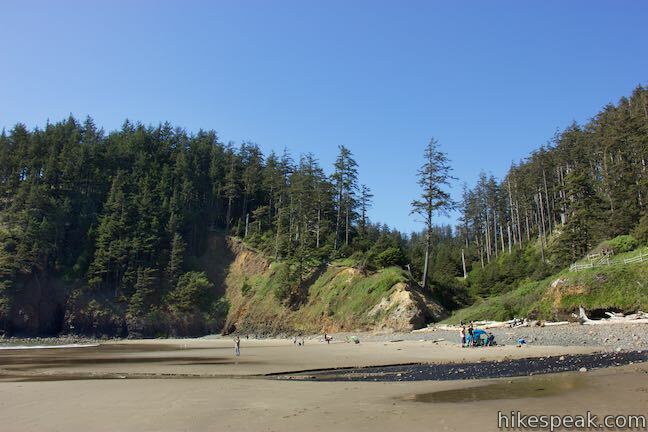 If you’d like to follow up the hike with some time on the sand, it probably makes sense to start at Indian Beach. 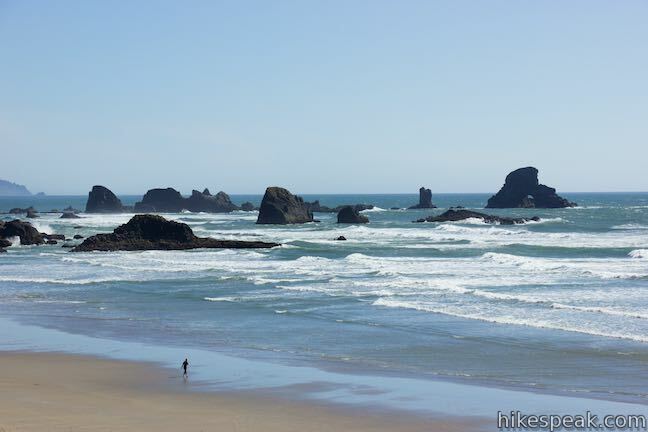 Otherwise, the scenery will unfold somewhat more dramatically if you start from Ecola Point. 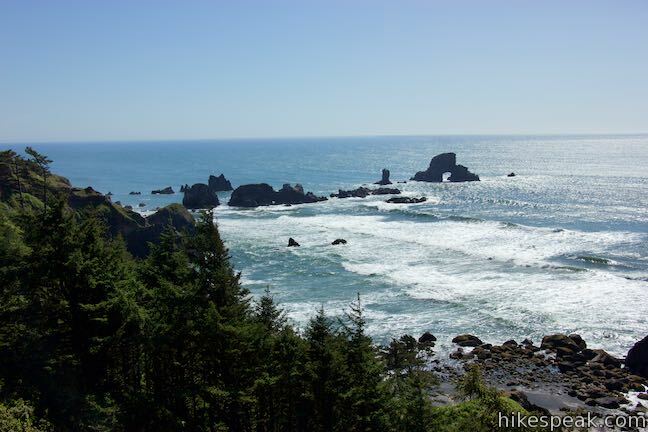 The directions described here begin from Ecola Point and reach Indian Point on a 2 2/3-mile round trip hike with 350 feet of elevation change. 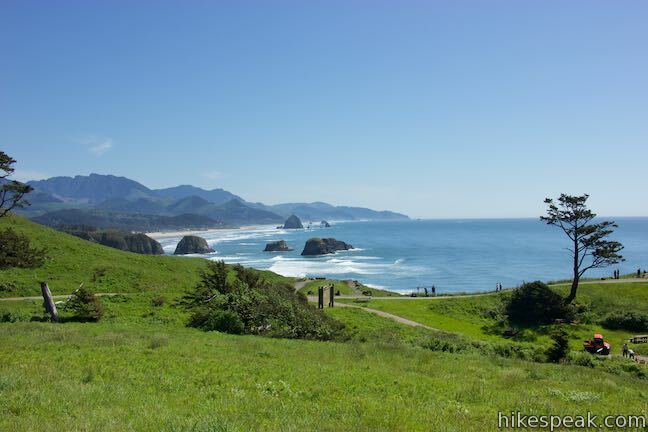 Make your way from Cannon Beach into Ecola State Park to the first oceanfront vista and trailhead. 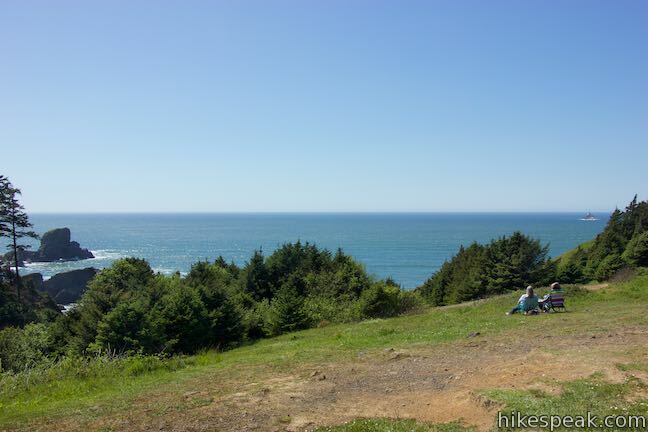 Ecola Point has a large parking area and an equally expansive grass lawn with picnic tables and broad ocean views. 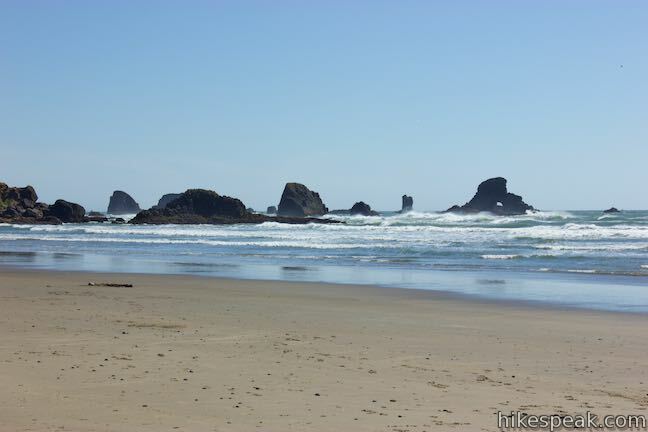 Walk out on the lawn and admire the surroundings. 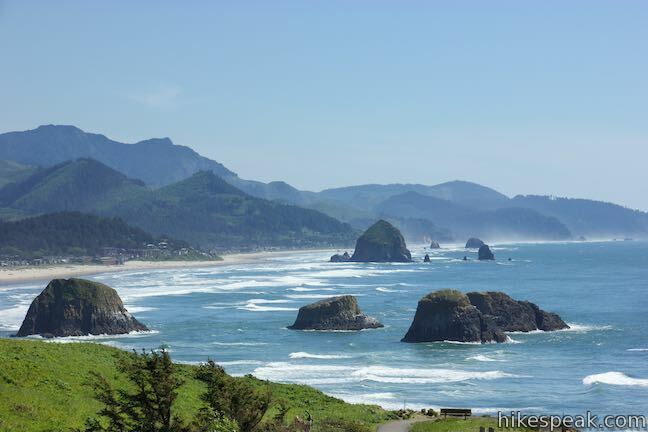 To the south, the coastline curves past Cannon Beach toward wide green mountains. 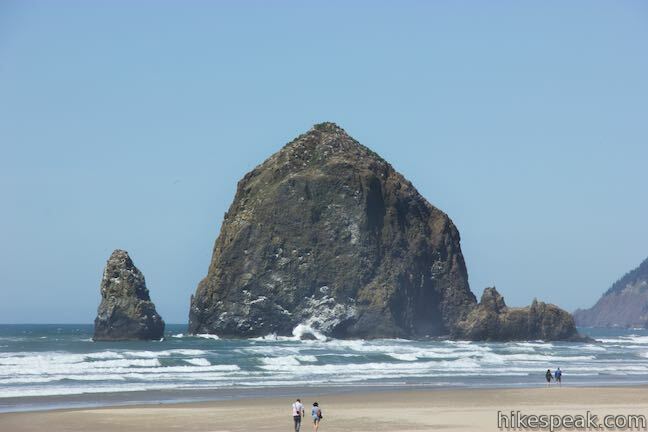 A 235-foot tall bloated pyramid of basalt sits just offshore. 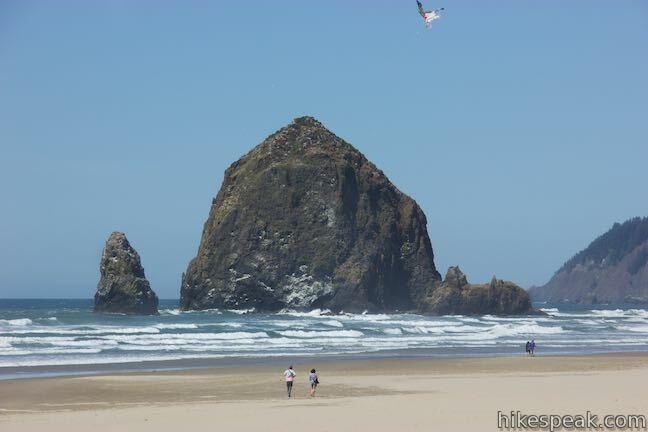 This is Haystack Rock, which can be reached at low tide and should not to be confused with a rock with the same name next to Cape Kiwanda. 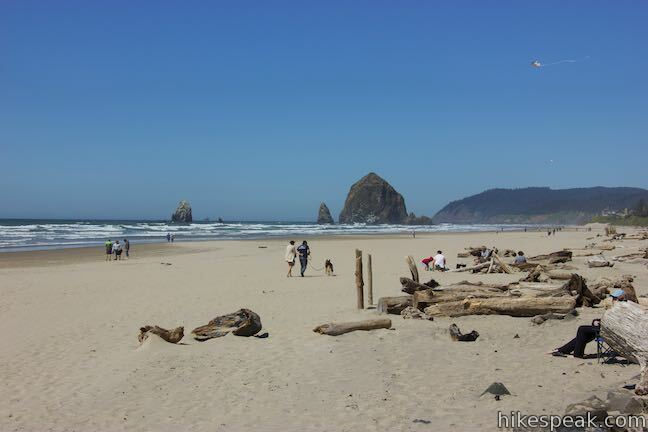 Haystack Rock is a much-photographed feature in Coastal Oregon. 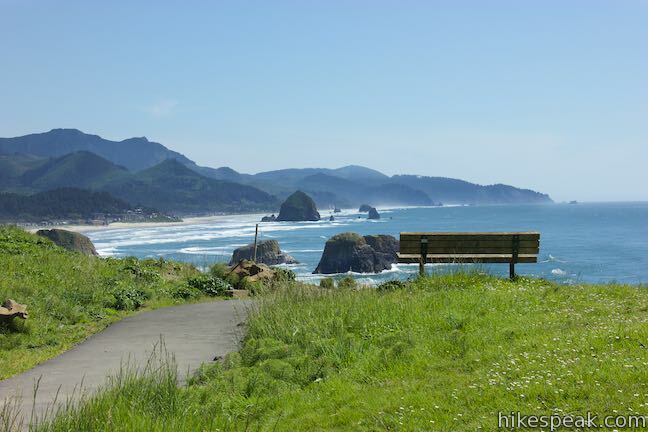 A paved trail drops to the south for closer views of Cannon Beach. 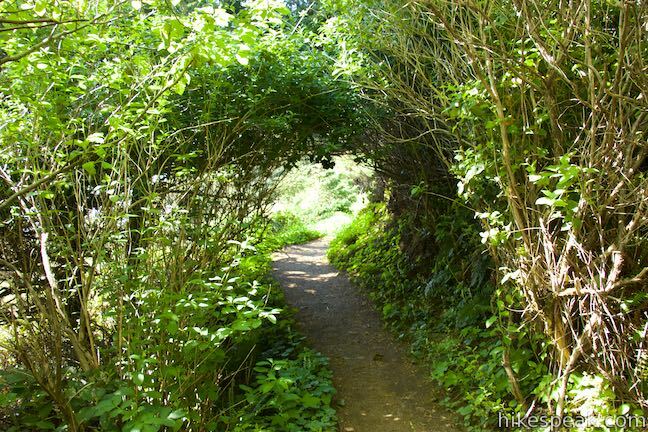 Explore this path for a short addition. 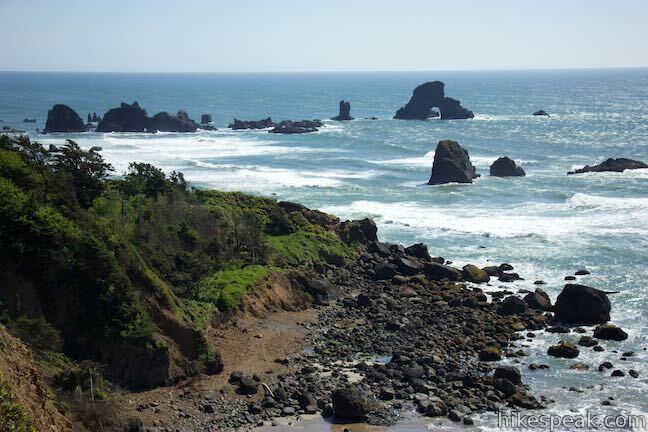 The end of Ecola Point has been closed off due to safety concerns from erosion damage. 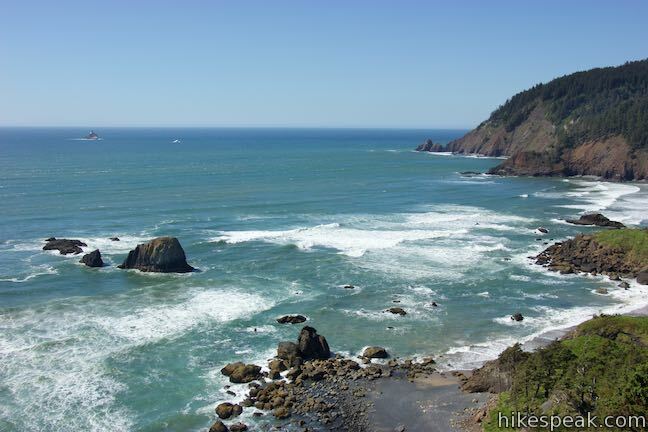 The trail to Indian Beach heads in the opposite direction, north. 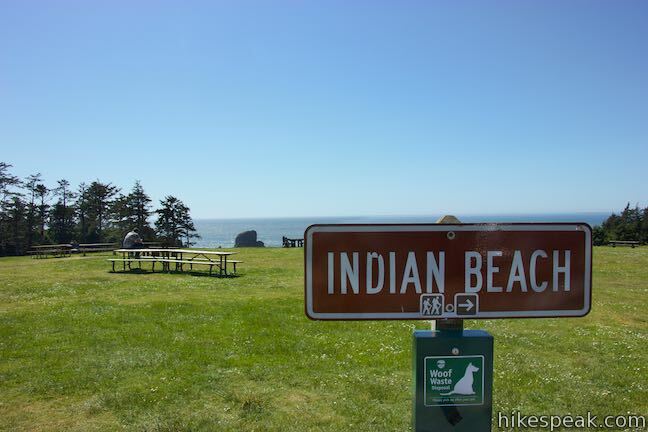 Find a sign for Indian Beach with a small arrow pointing to the right. 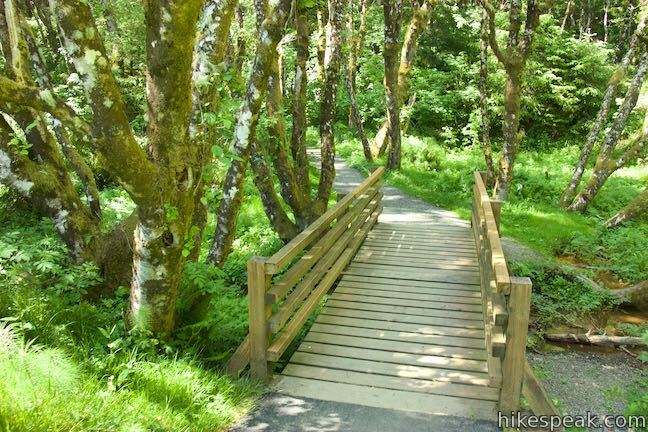 Take it and follow a paved trail down into the trees. 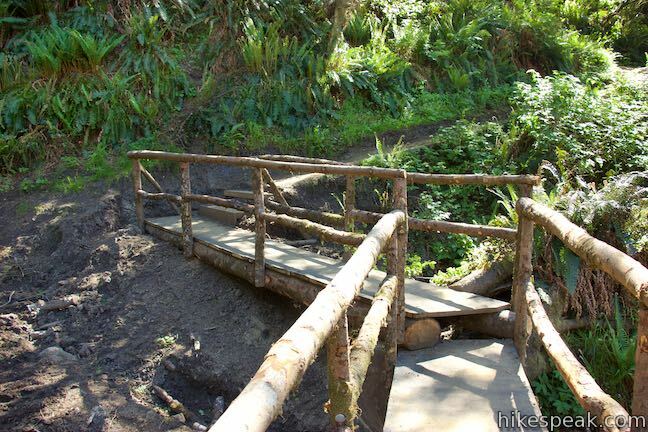 Cross a footbridge where the pavement ends. 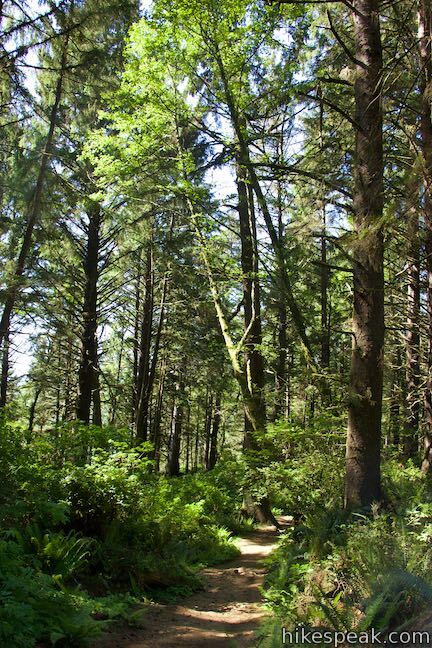 Oregon Coast Trail winds and weaves its way through a forest of western hemlock and Sitka spruce. 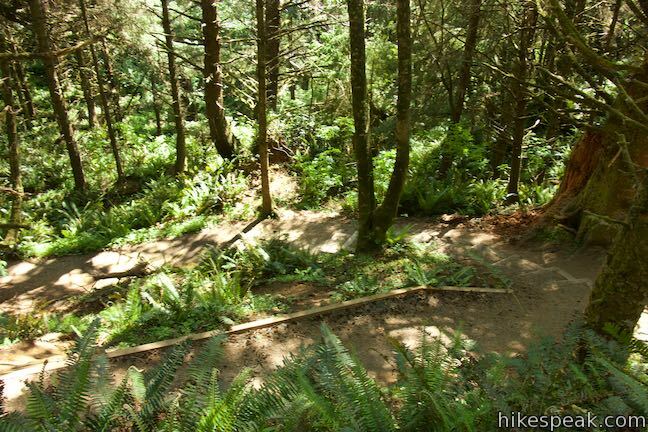 Ascend switchbacks to the spine of a ridge. 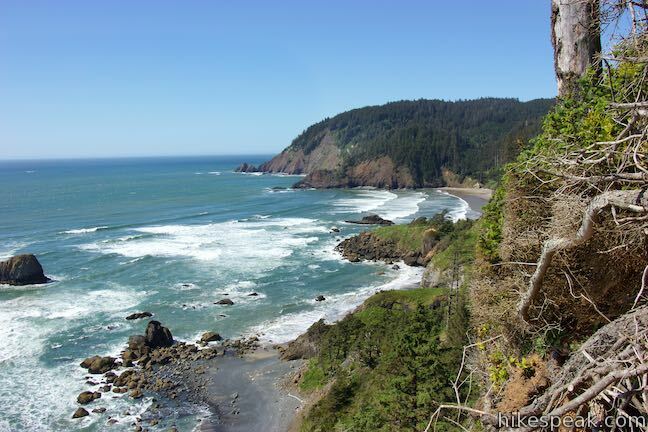 The terrain drops away rapidly on the other side for a broad perspective up the coast. 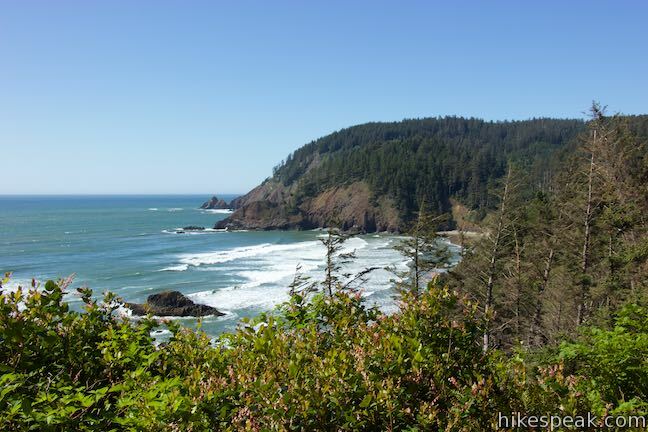 This is the trail’s first (of at least three) I-need-to-stop-and-check-this-out vistas. 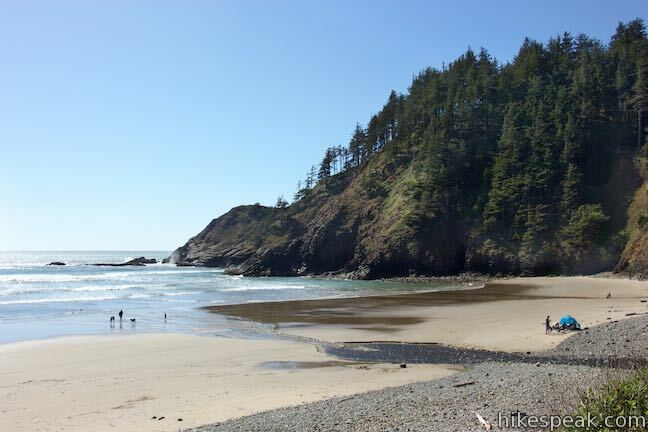 Indian Point juts into the ocean to the north, a dark rock topped by evergreens. 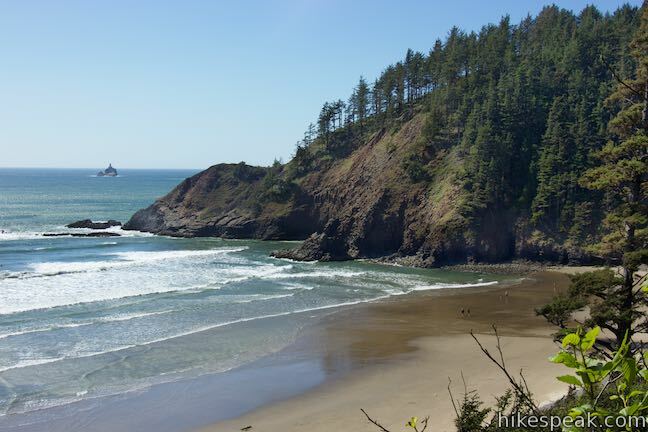 Indian Beach is tucked in front of the point. 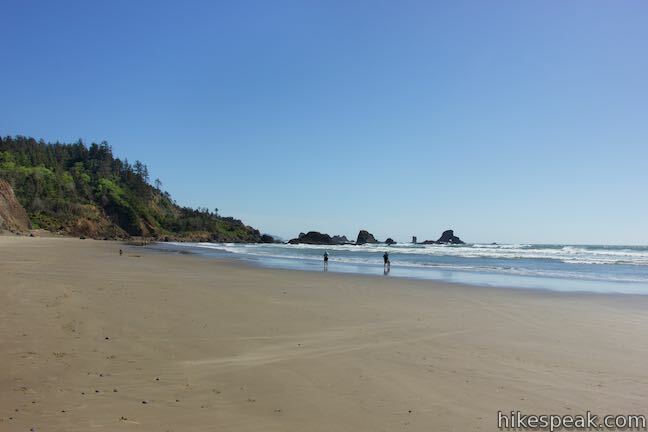 This sandy stretch should have few people on it outside of busy summer weekends. 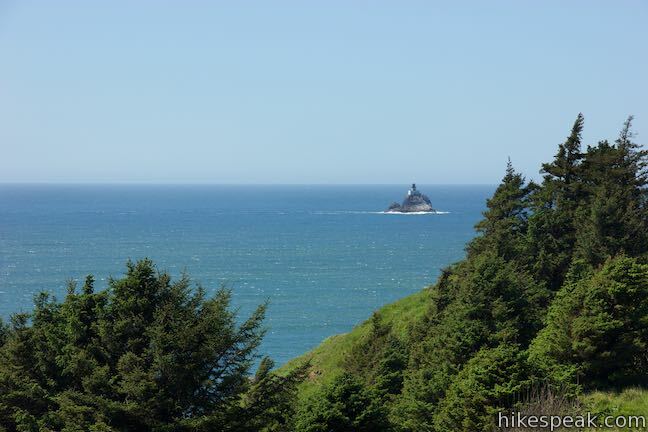 Offshore from Indian Point is Tillamook Rock Light, a lighthouse built in 1881 that has since been abandoned. 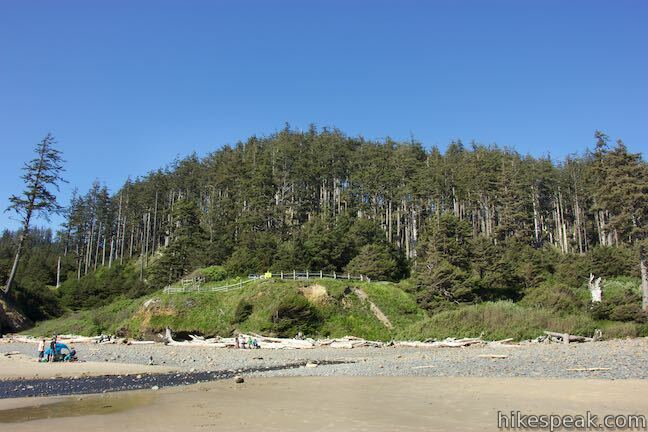 The lighthouse, nicknamed Tilly, stands 62-feet tall on a one-acre island. 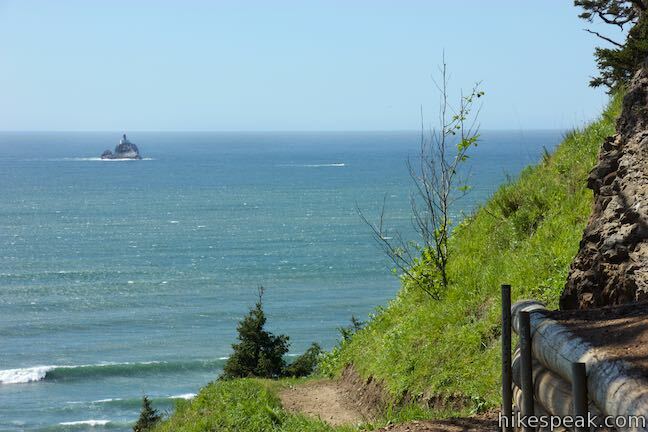 There’s no reaching Tillamook Rock Light, but you can visit a nearby lighthouse built around the same time, Cape Meares Lighthouse. 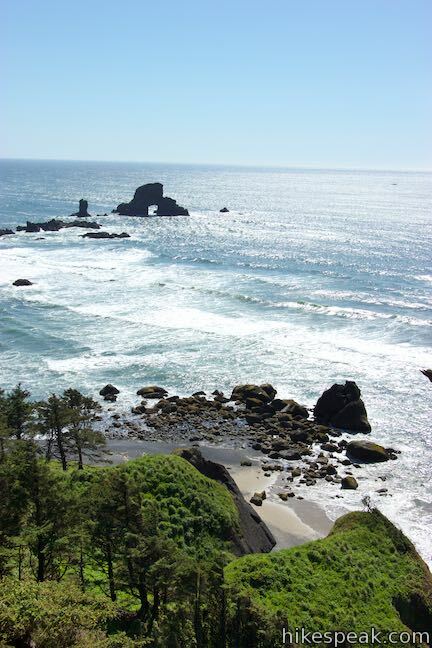 From this vantage, you can look straight down (or almost straight down) over a rocky shore. 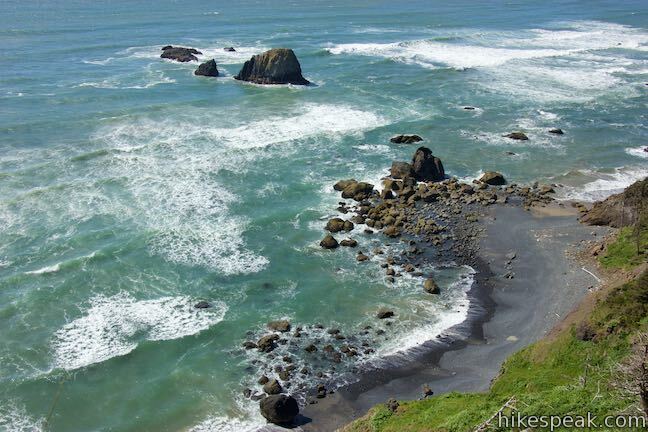 Watch waves wash up over boulders and pebbles. 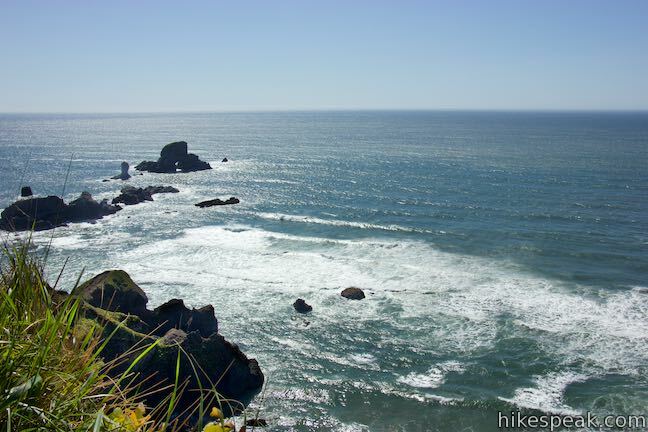 Dark rock islands lie just offshore, which you’ll get a better perspective of as the hike continues. 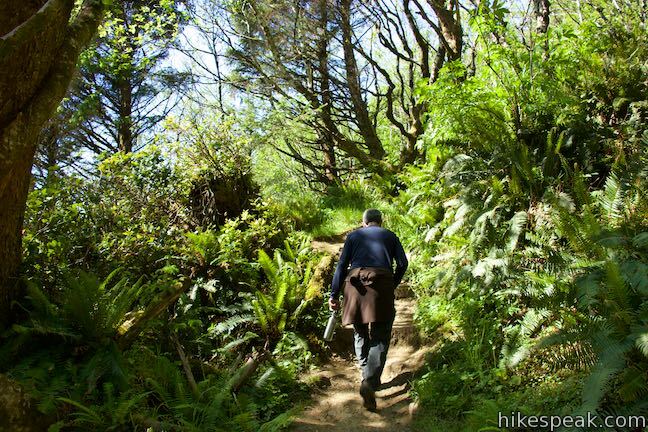 Bear right and press farther up the ridge. Crest the high point of the hike after 1/3 of a mile. 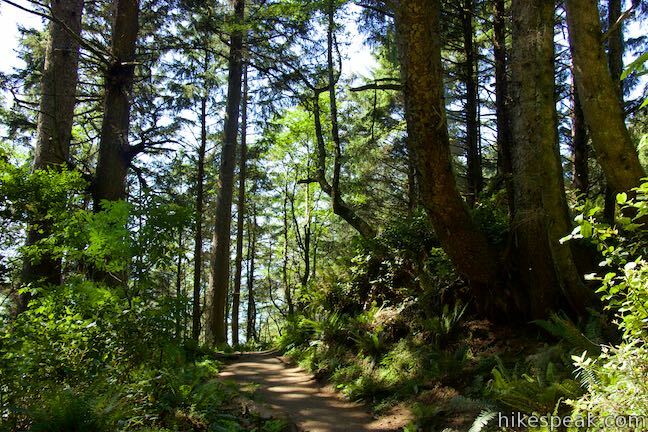 Make your way downhill again through more coastal forest. 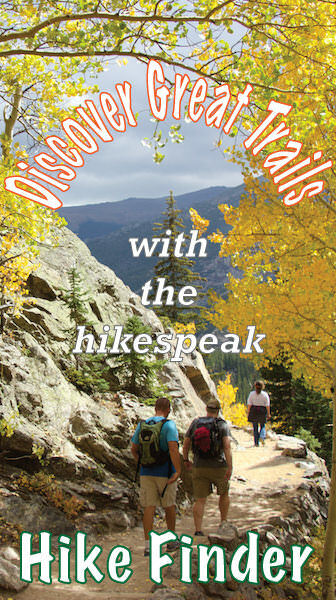 The dirt trail rises and falls as it weaves through a rugged landscape. 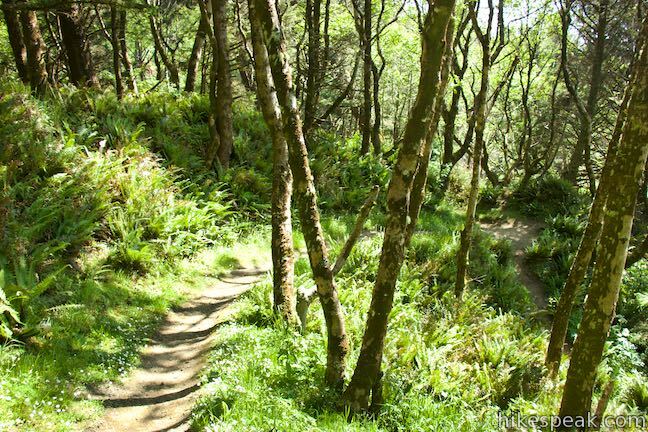 Eventually, you’ll curve to the left past a path that drops to the right to a tree with a gap in its roots big enough for a child to climb inside. 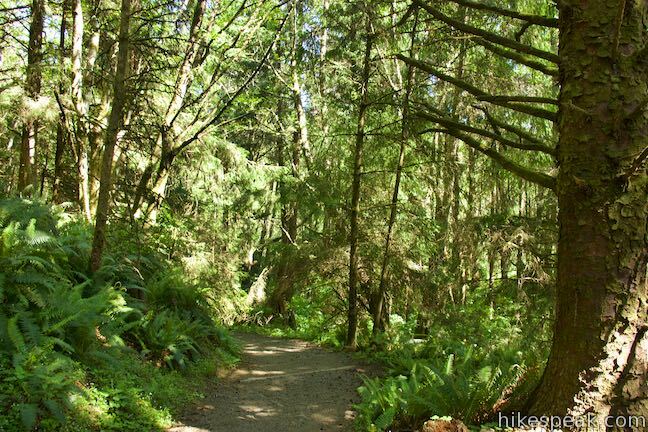 Continue around the bend as the trail exits the forest and rounds the side of a sunny bluff, 200 feet above the shoreline. 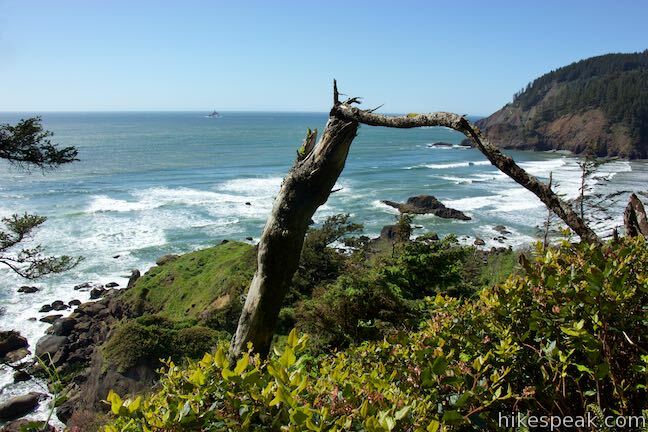 Take a look back toward the ridge you were standing on at the previous viewpoint, now just one element in a picturesque seascape. 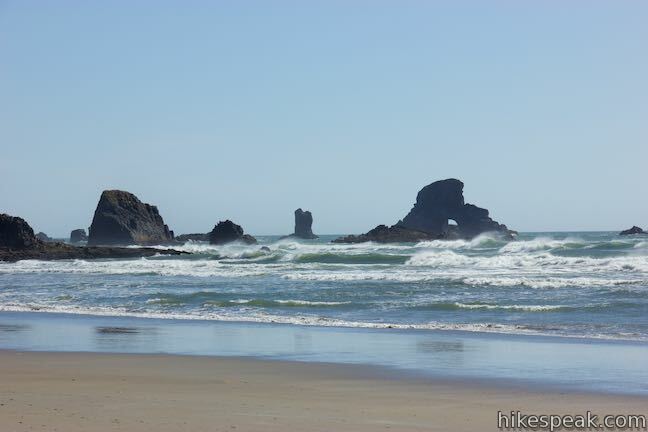 Gaze out toward a string of rock islands off Ecola Point. 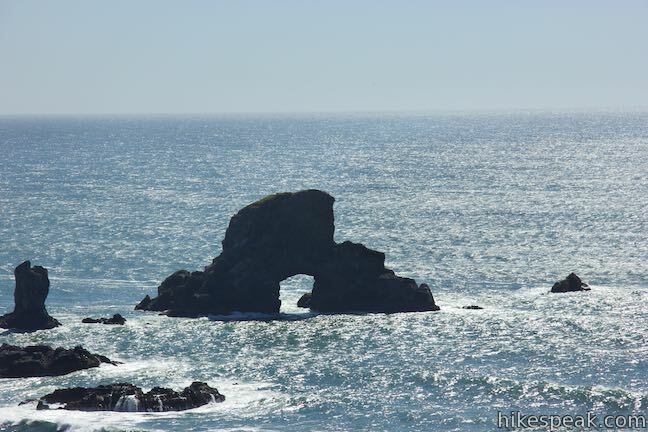 This perspective lines you up to look through a larger rock island with a tunnel carved through it. 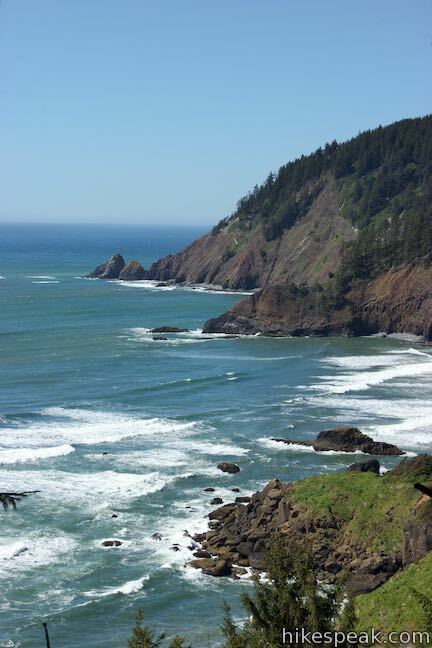 This is a postcard-worthy look at the Oregon coast. 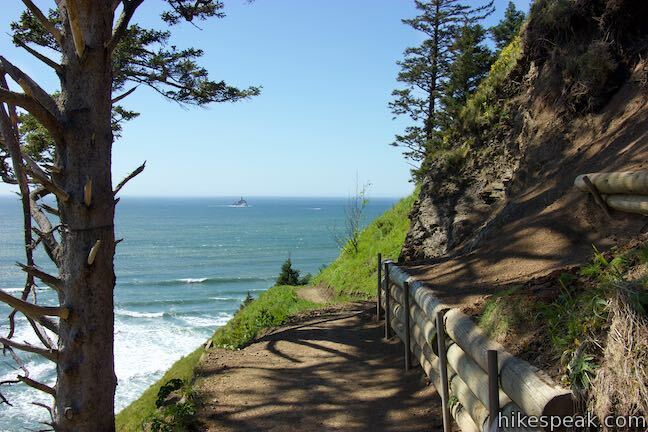 The trail makes a big curve around the end of the oceanfront hill (more ocean views for you). 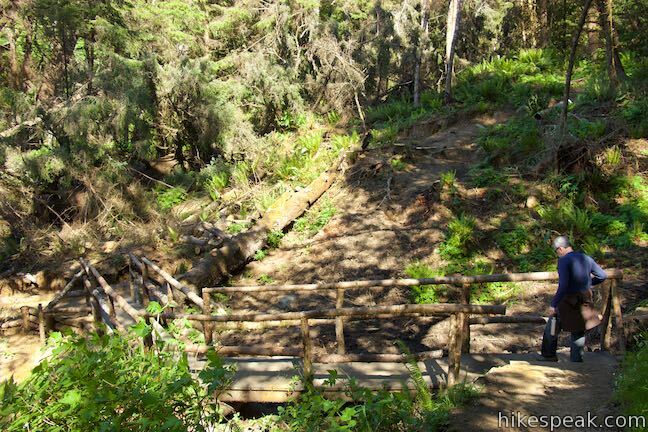 As you cross the halfway point, the trail descends into a gully and crosses an intriguing wooden bridge with railings made out of tree branches instead of lumber, resembling something designed for an Ewok Village. 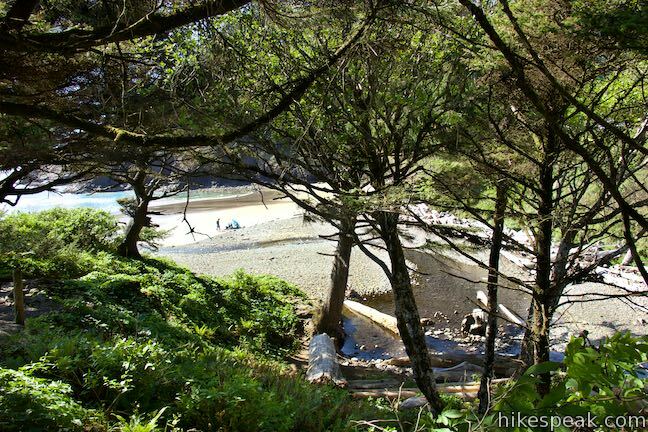 Proceed through a woodland perched above the south end of Indian Beach. 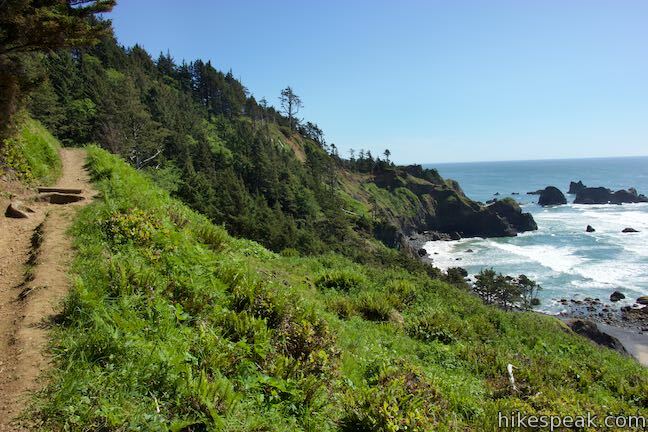 The trail turns uphill and comes to an important junction, 0.85 miles from Ecola Point. 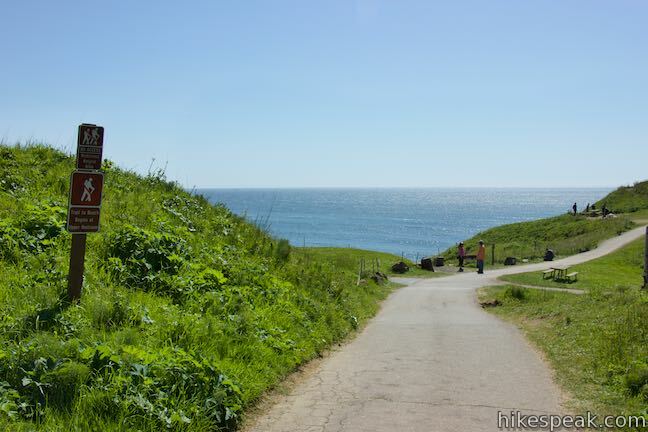 The main trail continues to the right, while a narrow track takes a steep route down to the beach to the left. 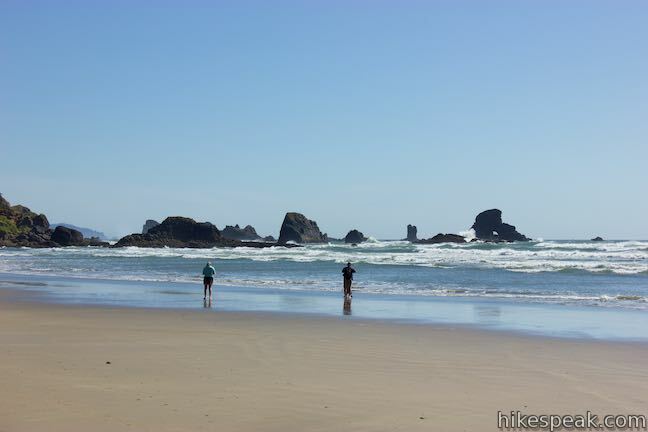 This beach-seeking spur off Oregon Coast Trail could be used to form a lollipop loop that incorporates a walk along the beach. 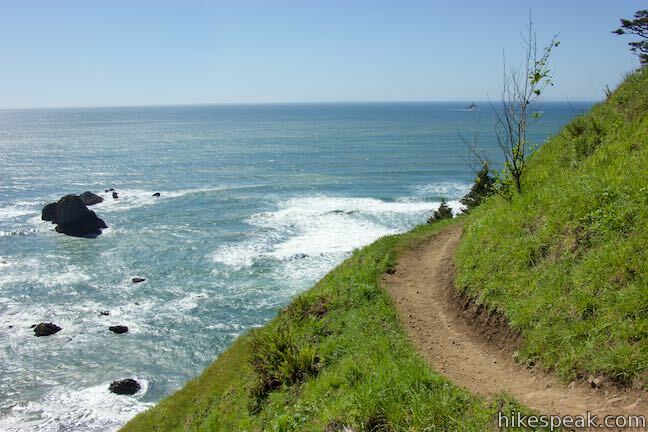 Moving forward, Oregon Coast Trail rises onto a ridge. 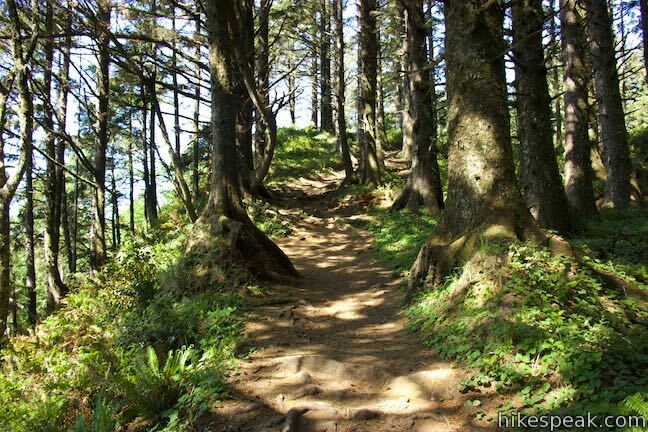 As you come down the other side, hit a third lets-take-a-break-from-hiking viewpoint. 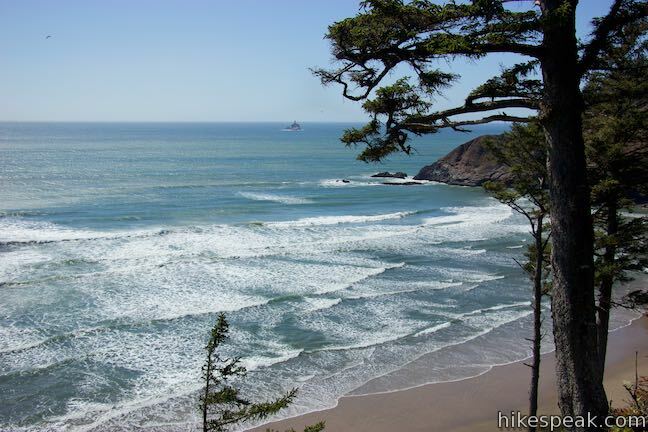 Look out over Indian Beach and rock islands being pummeled by waves. 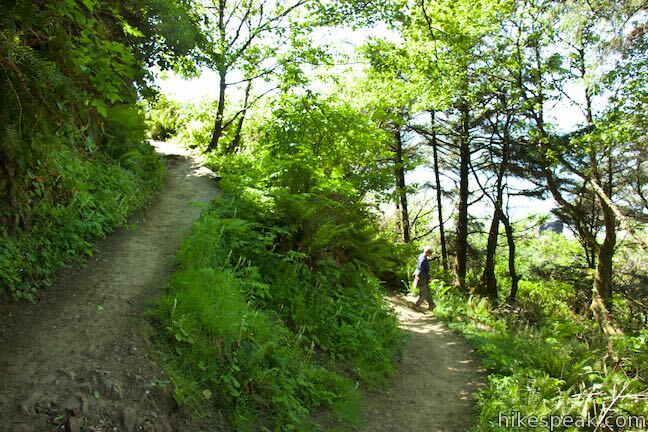 Turn right to continue with the trail, having hiked one mile. 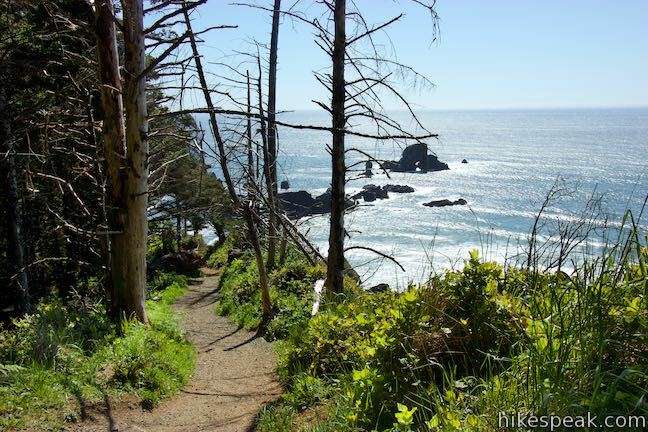 Over the next quarter mile, the trail leads mostly downhill across the forest’s edge to approach Indian Beach. 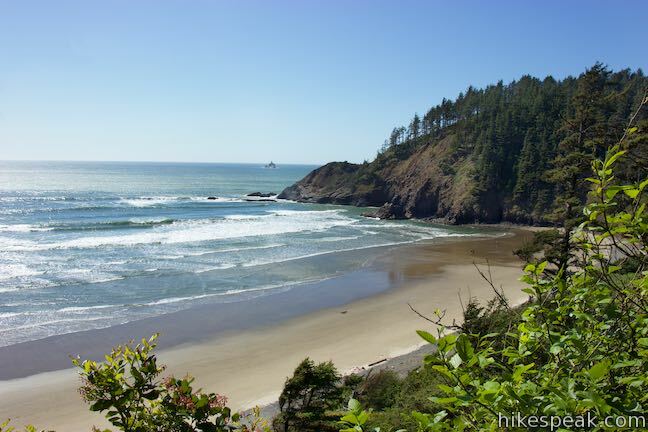 Catch intermittent views over and through the brush toward the alluring sandy beach and the more imposing Indian Point. 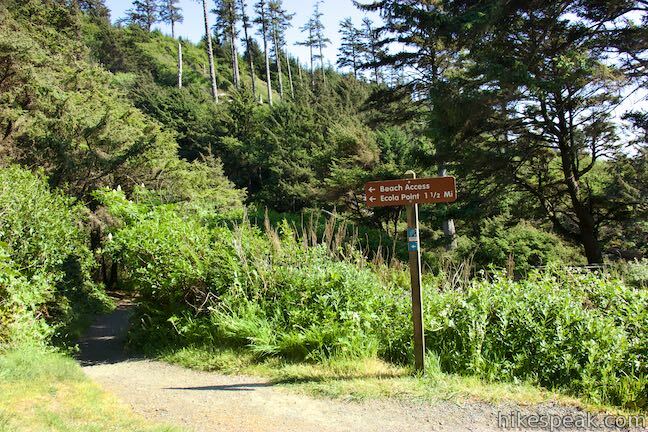 Come to a marked junction, 1 1/4 miles from Ecola Point. 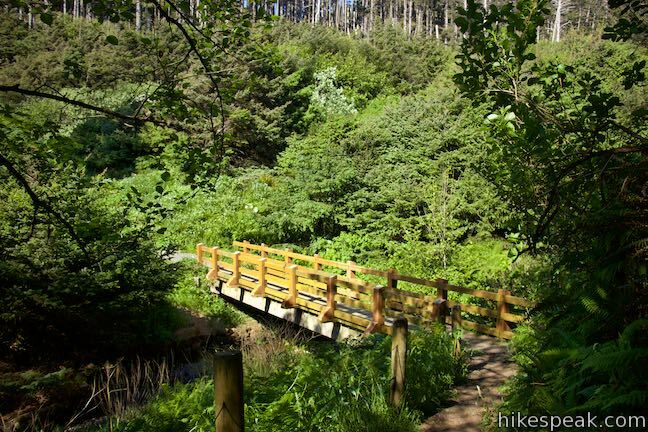 To the right, Oregon Coast Trail drops to a bridge over Canyon Creek followed by a short rise to Indian Beach Parking Area (1 1/3 miles from Ecola Point). 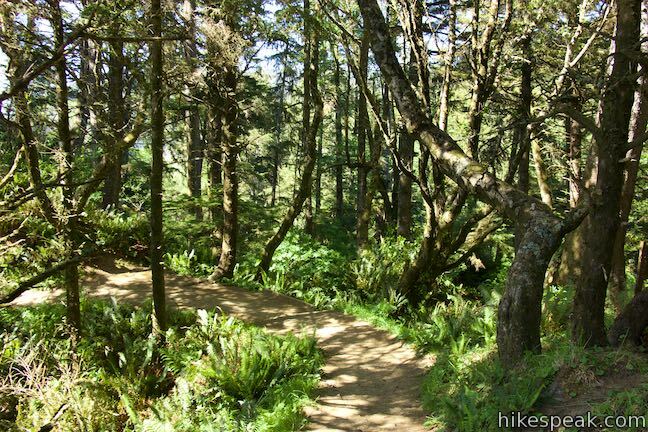 On the other side of the parking area, Oregon Coast Trail continues north to Clatsop Loop Trail for additional hiking in the park. 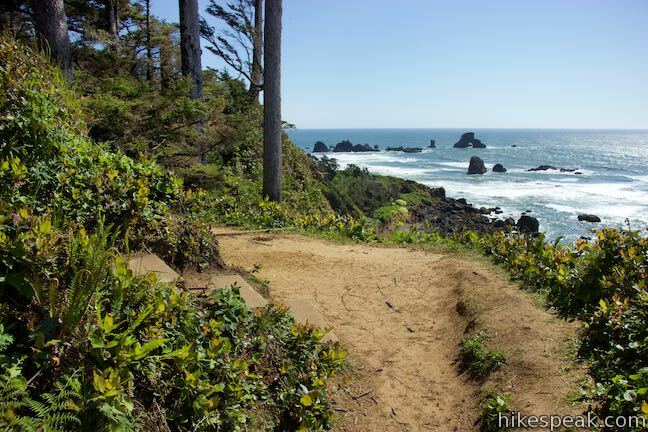 Unless you are getting picked up at Indian Beach Parking Area or venturing farther up Oregon Coast Trail, you can probably skip this last piece of the trail. 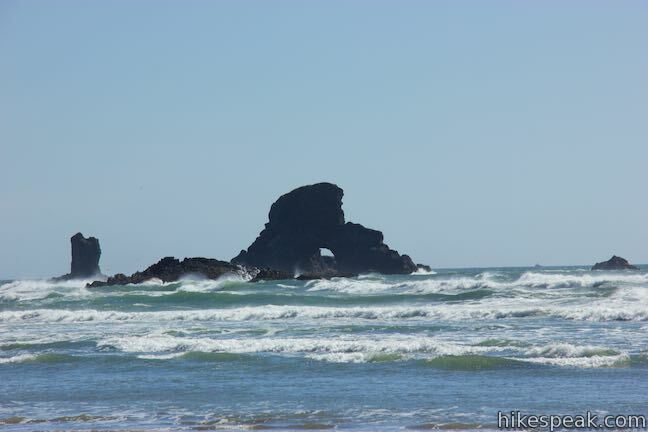 Turn left at the junction instead to hit the sand. 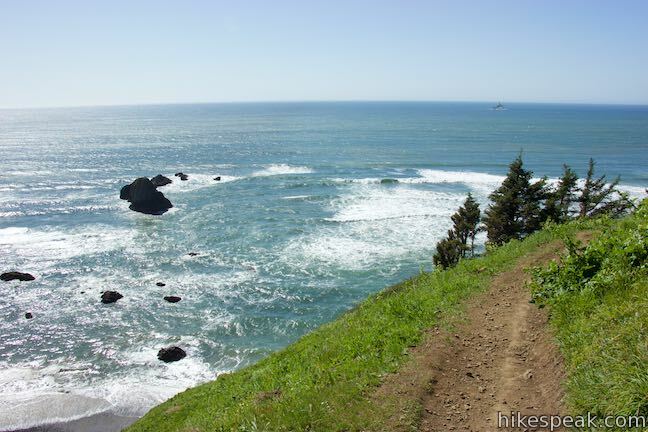 Turning left at the junction, you will find a short trail down to Indian Beach. 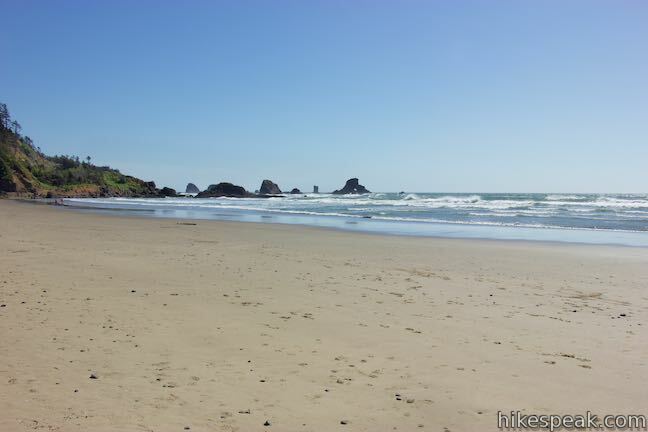 Stroll across the sand at this beautiful retreat. Indian Point towers over the north side of the beach. 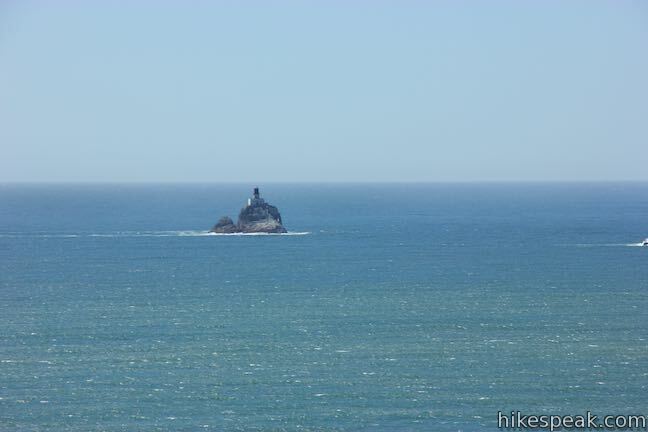 Tillamook Rock Lighthouse sits just offshore. 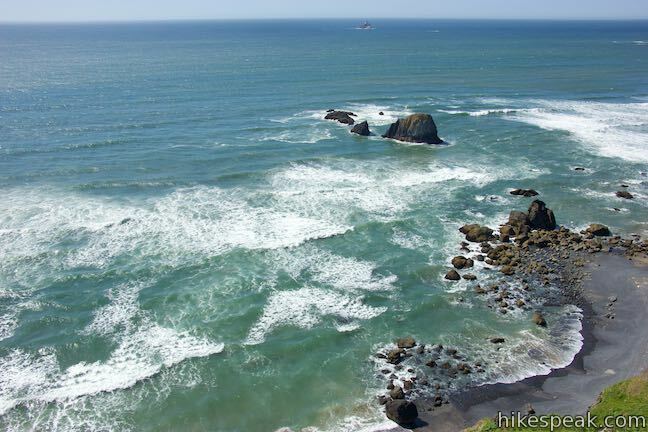 Look south down the coast toward an impressive collection of rock islands. 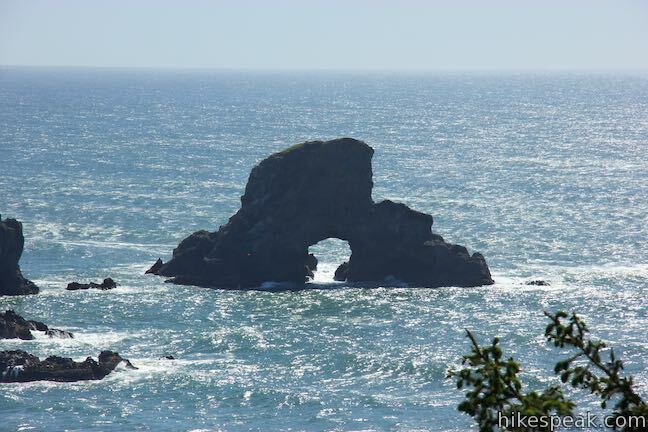 The island with the tunnel cut through its base will definitely attract your attention. 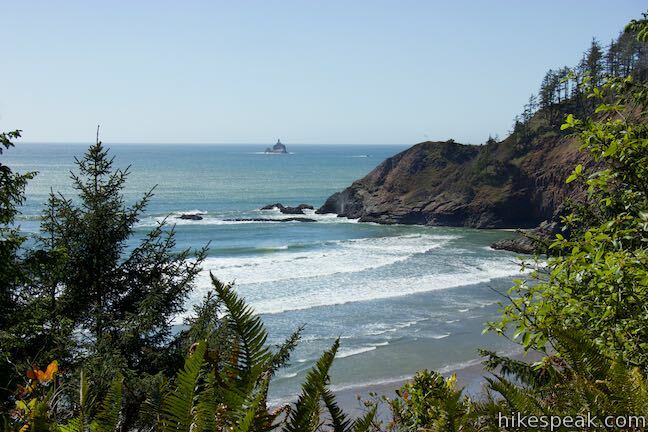 When you’re through with Indian Beach, you can turn around and hike back the way you came. 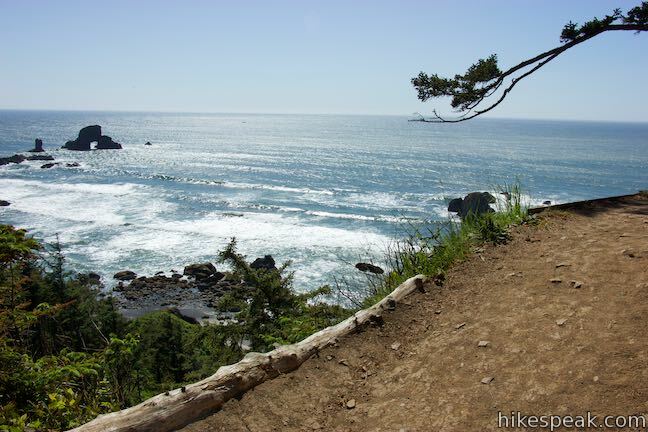 You could also saunter down to the south end of the beach, find the path up through the forest to Oregon Coast Trail and add a short loop to your hike. 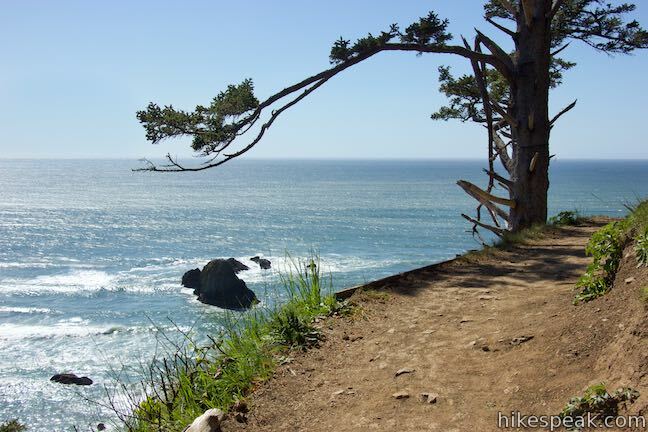 The out and back distance for Oregon Coast Trail between Ecola Point and Indian Beach is 2 2/3 miles round trip with 350 feet of elevation change. 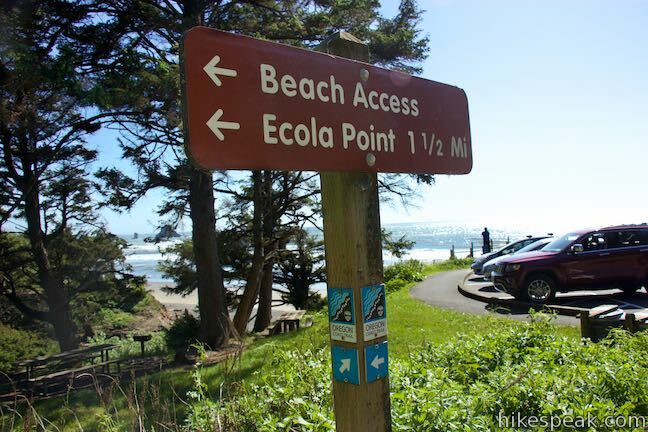 A $5 day use fee (or annual state parks pass) is required to reach the trailheads in Ecola State Park. 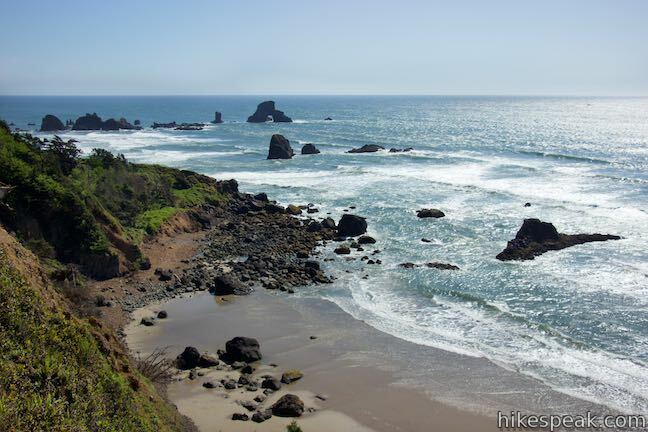 During the gray whale migration from December to January and March to April, keep an eye out for gray whales passing Ecola Point and other perches in the park. 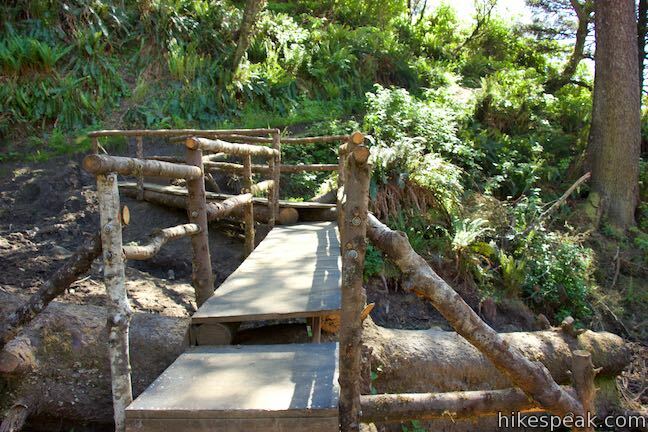 No permit is needed for this hike. Bikes are not permitted, but dogs are welcome. 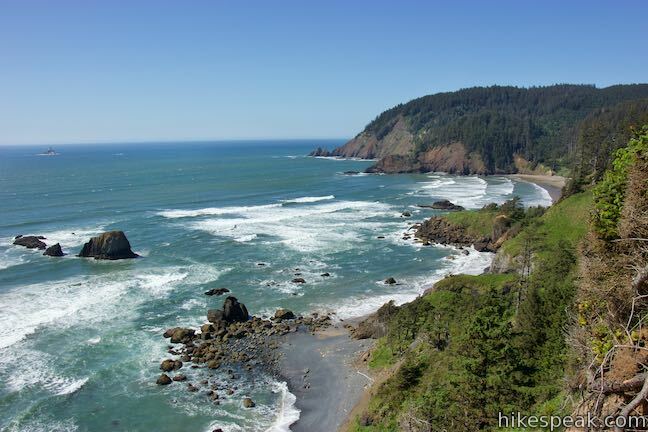 To get to the trailhead: From Portland, take Route 26 west for 74 miles to Highway 101. 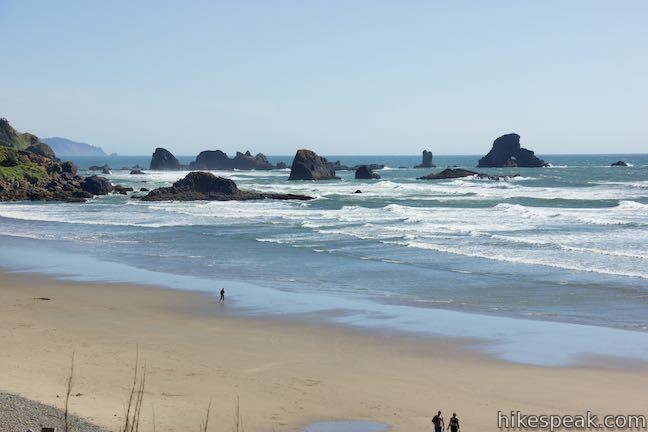 Take the ramp and drive south for 3 miles. 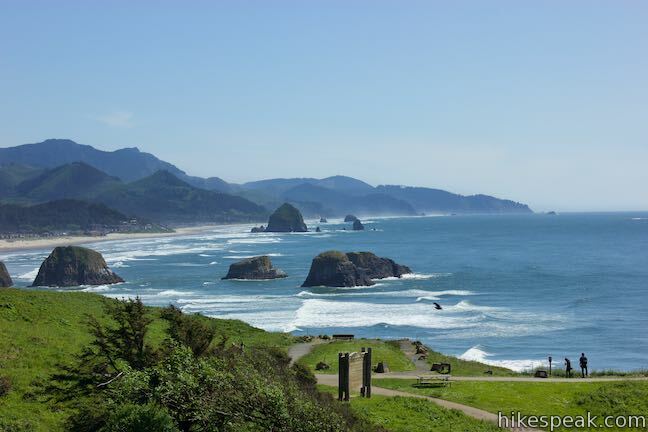 Exit Highway 101, following signs for Cannon Beach City Center and Ecola State Park. Bear right down the ramp and turn right onto East 5th Street. 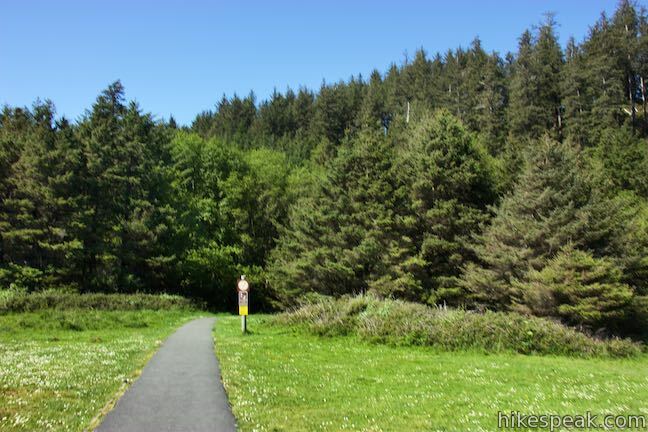 Drive a few blocks, cross a bridge over Logan Creek, and turn right onto Ecola State Park Road. 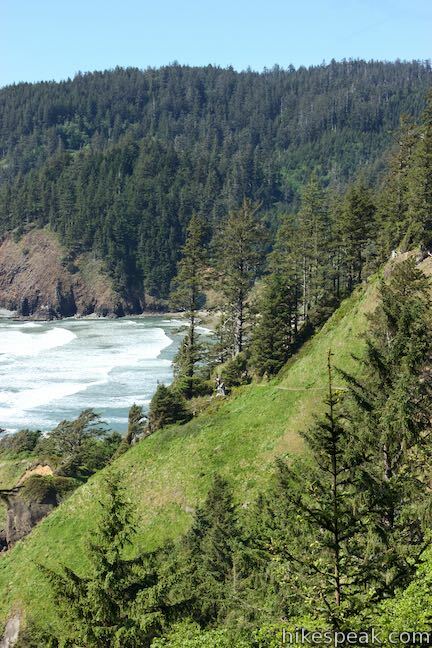 Drive 1.5 miles up this narrow, winding road (which is not suitable for RVs or trailers). 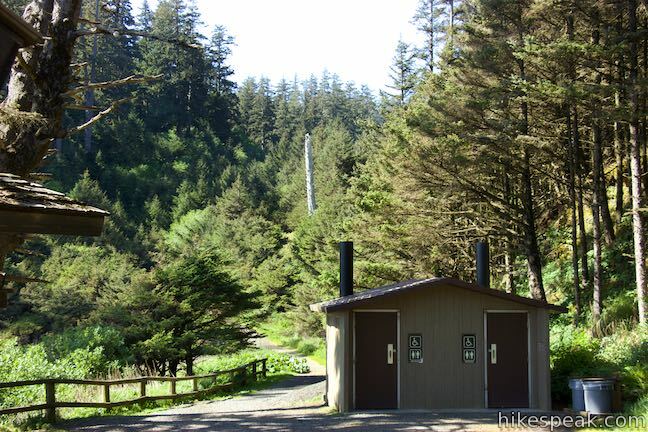 Pass the park entry booth and bear left to drive the final 0.2 miles to Ecola Point Parking Area (to reach Indian Beach, turn right after the entry booth).